"For the Love Of..." continues on Kim's Texture Tuesday this week; currently, it's "Perfectly Imperfect." Beautiful delicate image...love your framing and words. Gorgeous image, love the words you've added to it... so true! Very beautiful. Best wishes from Janine ( germany)! 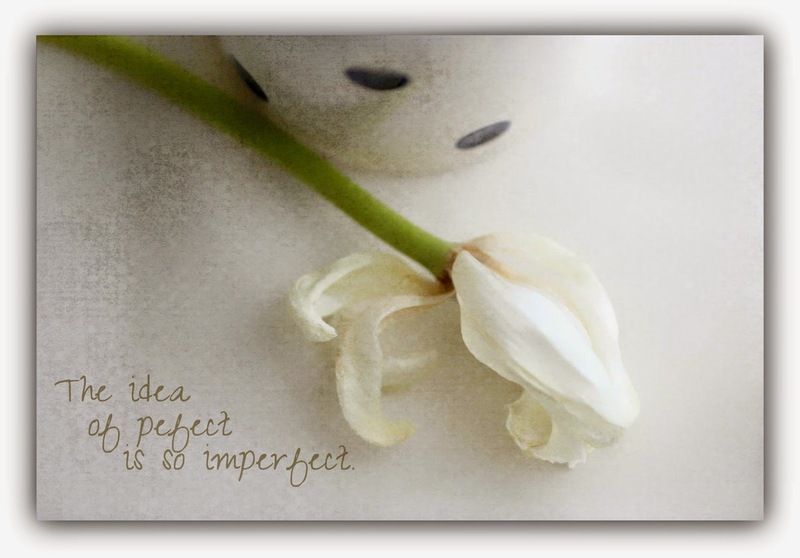 Beautiful...soft whites, from above, and the quote...Love it!! I love that quote, and your image is so perfect with it. This is beautiful. I really like the softness of the texture. OOOH. Pretty image and the words ... so true, so, well ... perfect! What a great quote, and such a delicate image. So pretty! I love all of the texture that you added - beautiful! It is a great photo, I still can't get the hold on it to use the textures, but love so much looking at them how you made this look so nice. Thank you for your comment to. Have a great day. Beautifully done. Great composition with the two dark dots on the cup and the stem leading the eye to the flower. Great quote.